Canada and hockey are the peanut butter and jam of the sports world. They go better together. Hockey card collectors have had many opportunities to collect Team Canada cards over the years, but there have been very few traditional mainstream set dedicated to the national program. 2013 Upper Deck Team Canada Hockey is one of those exceptions. 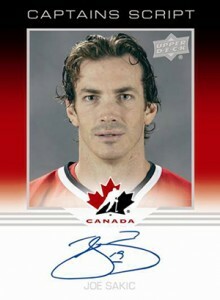 Around 200 players who have represented the red and white have signed for 2013 Upper Deck Team Canada Hockey. Autograph sets include Base Signatures, numbered Program of Excellence Alumni Signatures and Captains Script. Every hobby box guarantees at least two autographs. About every third box has a third autograph. 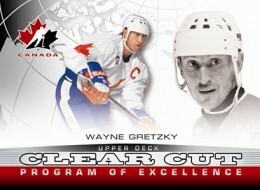 Numbered to 99, Clear Cut Program of Excellence cards give some of Canada's all-time greats the acetate treatment. Special Edition SE cards, which fall 1:6 packs, are a familiar name for long-time collectors. The foil cards have a die-cut Gold parallel that can be found 1:96 packs (1:4 boxes). Trade Upper Deck mystery redemptions appear as a case hit. While the names of the two players are under wraps, the card maker has acknowledged they're part of the 2013 NHL Draft. Trade Upper Deck Gold cards that are good for autographed versions are inserted 1:1,460 packs. 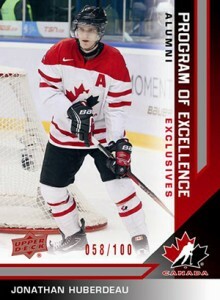 The 2013 Upper Deck Team Canada Hockey base set has 160 cards plus another 100 short prints, which fall one per pack. The set has multiple numbered parallels including Exclusives Red (#/100), Exclusives Gold Spectrum (#/10) and Printing Plates. I will definitely buying these. They look absolutely fantastic. August is an expensive month with OPC and now this set coming out! The quality of the designs is exceptional. I’ll definitely be purchasing these when they release. I am particularly excited to see the Clear Cut cards. I think those will be the top designs in the set. Between this and UD Series I, my wallet will be busy. Without a doubt, this is an amazingly good idea and with the Olympics around the corner, timing couldn’t be better. I will be going hard for all the sub sets, inserts and siggy’s in this set. Is the release date confirmed and set in stone for next week? I haven’t had much luck with the 2013-14 Upper Deck series One, but I am really impressed with this set. Great looking cards and at a decent price. Pulled a Phaneuf black printing plate. Just bought another two hobby boxes. Got another print plate, two Clear Cut POE and a Trade #2 card. I noticed a misprint one one card. Card No. 26 Chet Pickard his place of birth reads “aWinnipeg”. Still a fun set to complete. As of right now I’m 20 cards short. A very nice looking set, as UD typically does, with players past, present and future. There’s a few too many NHL cup-of-coffee guys and it would have been nice to have some inserts or subsets based on teams or great moments, instead of the same players with slightly different cards, though the clear cut cards are nice pulls. Still, a great item for set builders and Team Canada fans. Pulled a Gold Traded One card this past weekend. How many of those Traded autograph cards were produced? Does anyone know? Got my answer….99 autograph cards have been produced. Only nine calendar days from the time I redeemed the card until it arrived at my house. UD used FedEx to send it to me.